We currently have just under 700 Nursing students taking the three-year full-time BSc (Hons) degree courses in Adult Nursing and Mental Health Nursing at our Havering campus, Harold Wood in Romford. Also, our Continuing Professional and Personal Development (CPPD) portfolio includes a range of courses, modules, study days and bespoke projects that meet the needs of NHS service colleagues as well as courses for Bands 1–4. 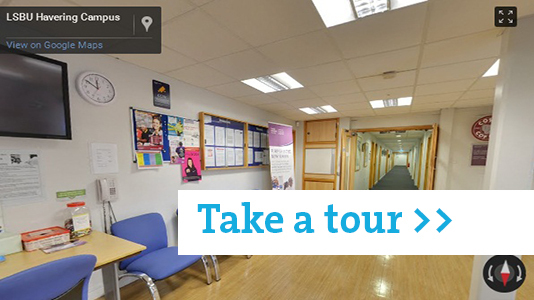 Take a tour of the Havering campus. At Havering there are three nursing skills laboratories, plus modern teaching rooms as well as an IT suite, a café, a large library and a student common room. The nursing skills laboratories are set up to replicate hospital wards, students use them to learn new nursing skills and practice in a safe, supervised environment prior to learning in a practice placement. The campus environment here is designed to be friendly, warm and welcoming. Classes are small and the campus has a tight knit community, which enables students to make friends and socialise with each other. Students have easy access both to academic and support staff. Within the laboratories a simulator mannequin is used known as SimMan. This computer controlled mannequin can be programmed with various clinical conditions, and is operated by computer in real-time which enables it to respond to the students' actions. SimMan can be male or female and breathes, has a pulse, blinks, sweats, and can speak and groan in pain. Read more about the way students practice on SimMan and the value of using SimMan before students go out on placement.